很久沒來分享了. 哈, 一來工作較忙, 二來每次介紹, 我都會自己用上一段長時間, 起碼用去半支及真的見到成效, 才敢通知大家. 因你們實在太恐怖了, 一說出來, 竟可買到斷貨, 自感有責任保障你們的錢包用得其所, 所以不是用過無副作用及好用, 都不會胡亂告知大家! 如我起床不洗頭吹髮是出不了街的, 因很像金毛獅王一樣, 另外, 我吹完頭, 頭髮仍會有毛燥的情況出現, 即是頭髮表面好像有很多毛毛彈起, 有很不貼服的感覺. 直至我用這個, 才發現自己都可將頭髮吹得跟髮型屋沒兩樣. 用法是你洗完頭, 使用毛巾抹乾頭髮, 然後再在髮上輕噴這支修護素, 然後正常由上至下吹頭, 髮質便會變得很滑很亮的了, 而且亦沒有毛燥的感覺. 而且, 我髮質很幼及薄, 最怕太滋潤髮型會變得很扁很難看, 但這支精華素卻沒此問題, 反而變得很有彈性及健康, 清爽, 實在是今年我的至愛髮型用品. 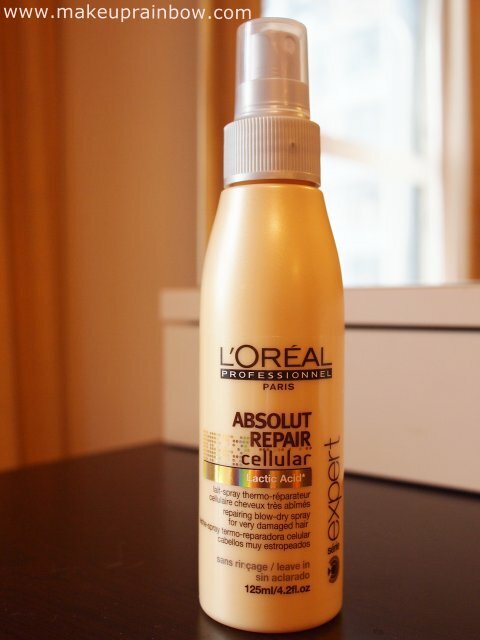 The lightweight formula with Lactic Acid, revitalises damaged hair, making it easier to blow-dry. Hair feels stronger, more supple and looks shiny as if transformed. Lactic Acid is able to create saline bonds between the keratin onto shampooed towel-dried hair or dry hair. Do not rinse. Blow-dry as usual. 除了我之外, 還有另一位受惠者, 就是Studio的Mary, 哈哈, 因髮型公仔常捲髮, 髮質都差到爆點, 結果我忍不住幫她們護髮了, 哈哈, 有學生開門入來看到, 應該覺得很詭異吧! 但這支應只在髮型用品店或Salon才有售. 約$200幾左右, 125ml. 如造型師遇到髮質毛到爆點的客人, 它絕對可以有很大幫助, 而且質地很輕, 髮型吹完亦感覺豐盈一點, 不會影響髮型會有崩塌的問題.